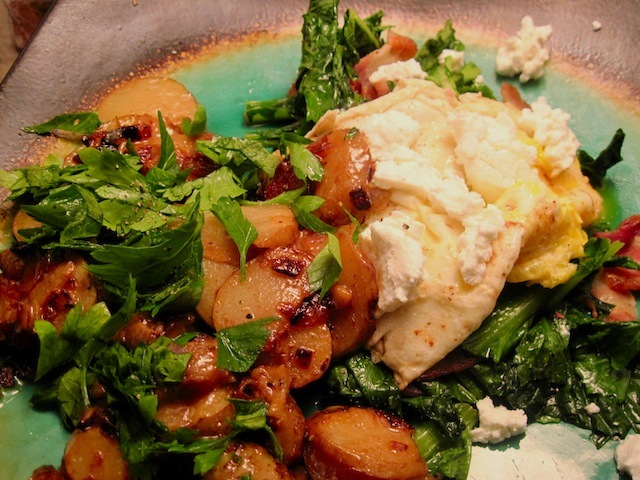 Even the Novelists Must Eat: Sunchokes in Cream & Greens with Cheese & Egg – Eat Me. Drink Me. So I wrote and writhed and ate pizza and finished up seven (!) whole pages. When I was done, when I’d picked the person who was going to die and felt like there might be a story, I realized I was hungry. I almost warmed up the second Celeste pizza for dinner – and then I remembered those clunky nubs of sunchokes from the farmer’s market and the parsley, the bacon, the greens, and felt, in good conscience that I couldn’t put a frozen pizza in the microwave two times in one day. And, as the next great American author (undoubtedly), I had to atone for the poor PR generated at the grocery store earlier in the day. No seriously, I watched the guy in line behind me judge. Anyway, I am just so excited about this food. It’s fresh and easy, and I love how green it is for November. This is my first time eating sunchokes and I love the center’s nutty, creamy taste complimented by the crunch of the outer edges. I know it looks a lot like my last meal, but it tastes so remarkably different: smooth and warm and gentle with whipping cream and fried eggs instead of vinegar’s tang. And it’s so beautiful to look at. I think I make a better cook than novelist. And on that note, I’m going to wash the dishes before my roommates come home and kill me and my novel is never finished. Fry bacon; when almost crisp, set aside. Reserve bacon drippings in skillet. 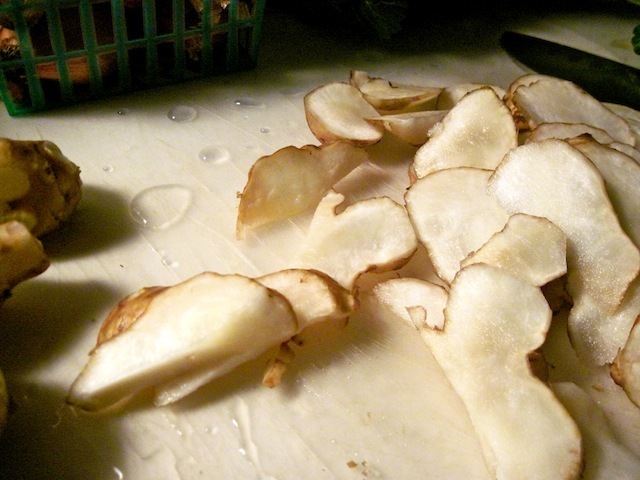 Scrub and wash a handful of sunchokes (also known as Jerusalem artichokes), then slice them thinly.In the meantime, heat bacon drippings with a splash of olive oil. 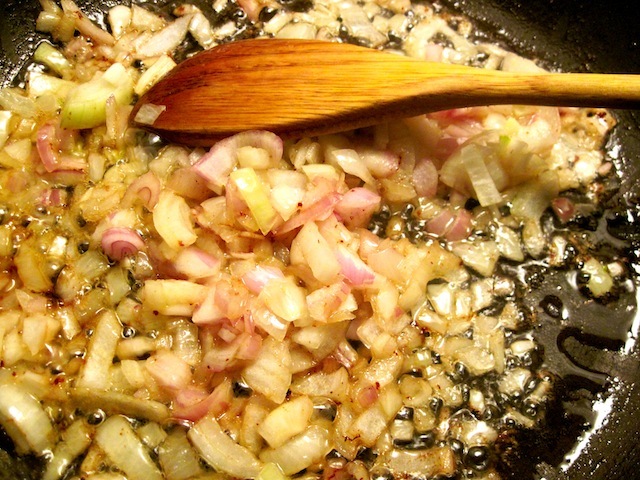 When warm add chopped shallots and garden onions; sauté until translucent. Add sliced sunchokes and sauté until tender, about seven minutes. Add a splash of heavy whipping cream and chicken stock, salt and pepper to taste, and ½ tablespoon butter and turn heat to low for another five minutes until sauce reduces. In another skillet, melt ½ tablespoon butter. Add washed and coarsely chopped greens and chopped bacon. Sauté for two minutes until limp; move to plate and cover. 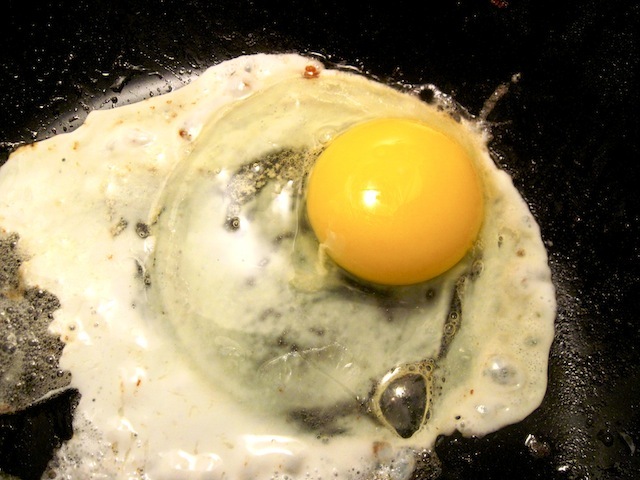 Fry an over-easy egg, making sure to leave the yolk runny. Flip the egg on the greens and top with crumbled goat cheese. 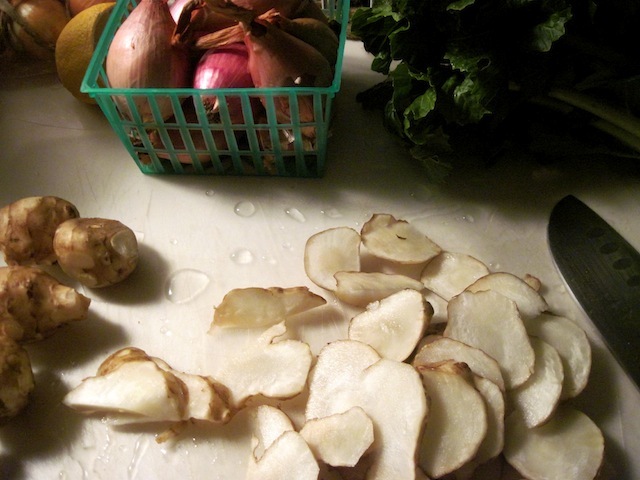 Add sunchokes to plate and garnish with chopped parsley. It’s my considered opinion that sunchokes increase novelistic fecundity about 73% per day. Have you had your cholesteral tested lately? What age do you have to start doing that? I saw a young lady – well dressed – in a toney French restaurant in Philadelphia recently eating thin slices of LARD. I sort of gagged watching the show. just as “mostardo” makes the mustard classier, calling it “lardo” makes the lard healthier.